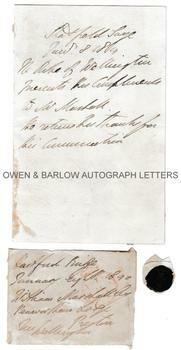 DUKE OF WELLINGTON Autograph Letter & Autograph Envelope Signed. Arthur Wellesley, 1st Duke of Wellington. British soldier, Victor of Waterloo and twice Premier of the United Kingdom. AL. 1p. Stratfield Saye. January 8th 1840. To William Marshall. Together with autograph envelope front, signed and wax seal of the Duke of Wellington with his impressed signet. "The Duke of Wellington presents his compliments to Mr Marshall. He returns his thanks for his communication." The envelope front is addressed in the Duke of Wellington's hand "Stratfield Saye, January eighth 1840. William Marshall, Esq, Penworthem Lodge, Preston" and signed "Wellington". 8vo bifolium. Approx 7.5 x 4.75 inches (19 x 12 cms). Staining to verso of blank leaf from old mounting paste but the text leaf is in very good condition. Envelope front measures approx. 4 x 3 inches (10 x 7.5 cms) and is somewhat browned with mounting residue to verso. Provenance: From the 19th century album of Emma Marshall of Penworthem Lodge, Preston. Emma was the daughter of William Marshall, landowner and cotton manufacturer and related by marriage to the Miller family of Baronets, M.P.s and landowners.